Chelsea maintained their seven game winning-streak Saturday afternoon at the expense of rivals Spurs, handing Mauricio Pochettino’s men their first loss of the Premier League campaign. The result ensures the Blues will travel to Manchester City next week as league leaders, but as expected Antonio Conte’s men endured a few issues to start the match. Within the opening 10 minutes, Christian Eriksen’s impressive opener forced Chelsea’s hands, but worryingly enough, Spurs were equally dominant in terms of their overall play. Spurs inconsistent form prior to kickoff was slightly downplayed, but Pochettino’s men were still the best defensive team in the league, due to an energetic press that was perfectly executed against Manchester City earlier this season. However, though Spurs were undoubtedly the better side then, they endured dodgy moments when they were unable to sustain their energy levels. What was key about the performance, in particular, was their efficient finishing in the final third. At Stamford Bridge, Pochettino’s men struggled to get behind the Chelsea defence despite negating their ability to build attacks from the back. Eden Hazard and Diego Costa were starved for service, and for large portions of the first half, Conte’s men were overrun in midfield. Dele Alli and Harry Kane were capable of receiving intricate passes in pockets of space, with the former’s movement playing a critical role to Eriksen’s opener. Meanwhile, Kyle Walker’s pace and strength exposed Marcos Alonso’s deficiencies in a wide defensive role. But it was only until the half hour mark where Chelsea began to grow into the match. Similar to their emphatic victory over City, Pochettino’s men began to concede space once their pressing decreased. Suddenly Victor Moses was an open outlet on the right, whereas Hazard and Costa found space to carry the ball into, albeit limited support from their teammates. Though Chelsea were presented space as the half progressed, a short spell that involved Hazard cutting off a poor Hugo Lloris pass, followed by Pedro’s incredible equalizer shifted the momentum into the hosts’ favour. The problems Spurs encountered towards the conclusion of the first half continued at the start of the second. Hazard was constantly fouled with his back to goal, whereas Costa worked diligently through the channels, but it was Moses’ pluck to charge past Son that proved decisive. Alonso and Moses’ proactive advanced positioning occurred subsequent to Spurs’ dominance within the first half hour, which was always the worry with Son and Eriksen operating in wide areas. Pochettino’s men simply failed to remain compact out of possession, and you can argue that they didn’t really have a plan B once energy levels decreased. More so, this is the concern with Spurs. Still showing signs of fatigue from last season, apart from the signing of Wanyama, Pochettino’s XI hasn’t improved significantly. Therefore, the onus is on players to exceed last year’s form, and with Spurs’ overall approach largely based on running, it simply doesn’t appear to be attainable. On the other hand, Conte deserves credit for reinvigorating his side: Chelsea’s shape didn’t change in the second half, but they closed down ball-carriers and open spaces quicker, and Alonso and Moses provided the width to stretch Spurs’ 4-4-2 throughout. Elsewhere, they equally managed the remainder of the match superbly once they went ahead. The Blues reverted to a 5-4-1 out of possession with Hazard and Pedro maintaining narrow wide positions to ensure Spurs couldn’t overload central areas. Apart from slight defensive mistakes and Nkoudou easing past substitute Branislav Ivanovic, Spurs failed to trouble an organized Chelsea outfit. Had this been a year ago, Chelsea may have encountered difficulties closing out a tight match, but there’s a sense of revitalization, belief, and hunger under Conte. Although the performance wasn’t comparable to previous home triumphs during this seven game stretch, champions often find ways to win matches when struggling to reach top form. If anything, this was an audition for a flexible City side that will have alternative approaches apart from Guardiola’s traditional high pressing. It’s possibly still to early to claim title contender’s status, but overcoming multiple formations and Spurs’ heavy pressing suggests the Blues are heading in the right direction. Alexis Sanchez’s opener hinted that three points would be a formality, yet this was a difficult outing for Arsene Wenger’s men. Sanchez and Alex Oxlade-Chamberlain’s pace earned two members of the Bournemouth back four bookings within the opening 10 minutes as Arsenal’s attacking quartet was built on pace and Mesut Ozil’s creativity. This was the ideal set up for Ozil to thrive in, yet the wide players were uninspiring following the opener, and the midfield pairing of Mohamed Elneny and Granit Xhaka struggled on both ends. Defensively, Bournemouth’s midfield trio easily bypassed the Arsenal duo en route to goal, and Joshua King simply dropped into space between the lines to combine with teammates. From an offensive perspective, Arsenal simply lacked the control Santi Cazorla, or Mikel Arteta once provided with a mixture of short and long passes to retain possession. At times the match was end to end, and Arsenal weren’t assured on both ends of the field. With that being said, Wenger at the very least would be pleased to see his best players doing their utmost best to salvage a result. Interestingly, Alexi’s varied positions witnessed the Chilean dropping deeper to supply penetrative passes for Ozil making runs beyond the Bournemouth back-line. Though the two Arsenal marquee signings were rarely on the same wavelength, the desperation to create plays and surge their teammates forward was fascinating. Arsenal improved significantly in the second half when Bournemouth retreated in their half opposed to pressing. Bournemouth was forced to chased the game following Theo Walcott’s winner, which ultimately benefitted a speedy Arsenal attack. Likewise, Sanchez doubled Arsenal’s lead and secured three points in stoppage time following a swift break featuring a well-weighed Ozil pass to ignite the move. Wenger’s side have made a knack of earning results albeit not playing their best football, and a developed partnership with Alexis striving in a centre-forward role ahead of Ozil in his optimum position could prove decisive if the Gunners intend on mounting a proper title challenge. He did it again. Yaya Toure wasn’t on the score sheet this week, but the Ivorian played a positive role in a narrow win against a resilient Burnley side. Guardiola named the powerful midfield trio that featured in majority of City’s game’s last season, but Toure was involved in several dangerous moves because he was positioned closer to Sergio Aguero and free of defensive duties. Although a brace at Crystal Palace placed Toure back in the headlines, here, he showcased what he has left to offer. Fernandinho and Fernando remained deeper in fear of the Burnley counter-attack, whereas Toure predominantly linked play with Nolito, who drifted into pockets of space in central areas. Sergio Aguero poached both goals but his involvement from open play was scare. Raheem Sterling operated in a wide position on the right, but oddly hesitated when he received the ball in key areas and was considerably ineffective in the final third. But Toure rolled back the clock with his quick incisive combinations and powerful sprints towards goal. Now, Toure might not feature in the City XI every week, but there was a glaring issue regarding their predictability from open play and the fear of David Silva and Kevin De Bruyne being overrun in midfield. It’s the dimension City lacked in the early stages of the season, and the new dimension to a fine-tuned flexible unit presents various ways to win in the near future. Guardiola will always be associated to the possession-based tiki-taka football that revolutionized the sport during his time at Barcelona, but his spell at Bayern proved the Spaniard can adapt to the cultural strengths that define a domestic league. In Toure, Guardiola may still require the Ivorian’s power, precision, and finishing ability around the penalty box, which further justifies his significance to the squad. Jurgen Klopp’s Liverpool fell to second place when they failed to score at Southampton, and they appeared destined to suffer the same fate against a resolute Sunderland outfit. Moyes aligned his men to disrupt and destroy, but the hosts were dominant for extensive periods throughout. For all of Liverpool’s patient build up and clever interchanging movement, the hosts rarely got behind the opposition’s defence. Resorting to long distance shots and poor set-piece execution kept the score-line leveled, while Sunderland were pegged so deep into their half that launching counters was nearly impossible with Defoe isolated upfront. The second half followed a similar tempo, but Patrick van Aanholt’s inability to play a final pass and Duncan Watmore couldn’t score despite rounding Liverpool keeper Loris Karius. Coutinho’s early departure and the absence of Adam Lallana deprived the Reds of genuine guile and creativity in the final third, as several crosses through the six-yard box went astray. Substitute Divock Origi’s individual brilliance won the game, but there’s a fear that Liverpool will struggle to break down opposing teams that replicate Sunderland’s approach. Perhaps Origi or Daniel Sturridge’s presence will be useful to poach goals without two creative cogs in Klopp’s successful system, and in truth, being forced to identify a plan B or C could reap rewards long-term. It’s now come to a point where Manchester United’s results represent the Premier League’s main mystery. Is it simply bad luck? Or do the players and possibly Mourinho need to be held accountable for consistently dropping points? This isn’t a Mourinho team we’ve been accustomed to falling in love with over the years. There’s been few significant individual improvements from the players that survived the Louis van Gaal era. Elsewhere, Mourinho’s father-esque mantra often associated with his most successful teams is non-existence. Once again, United conceded within the opening 90 seconds against West Ham, yet they rallied well subsequent to the goal. Phil Jones was superb at the back, while the midfield pairing of Ander Herrera and Paul Pogba occupied half spaces and circulated possession in a tidy manner. Youngsters Jesse Lingard and Marcus Rashford received glorious chances to put United ahead but spurned their opportunities, and though Antonio Valencia constantly motored past Dmitri Payet, the Ecuadorian’s crosses didn’t harm the West Ham back-line. Mourinho’s decision to omit Henrikh Mkhitaryan and Wayne Rooney following positive midweek Europa League performances perturbed United supporters, but the Red Devils weren’t poor, here. The worry, however, rests in United ensuring their positive displays earn the club maximum points on a weekly basis. Nevertheless, Mourinho will continue to be scrutinized for every United hiccup, but it’s reached the point where the Portuguese manager and the players come together and mount a legitimate top four challenge. At the moment, though, even that goal appears insurmountable. The battle for the final Champions League spot has become entertaining over the past few years. This season, North London rivals Tottenham and Arsenal, have been tipped to challenge for the final spot in Europe’s prestigious tournament, which has led to Spurs spending approximately £110.5m in the transfer window. However, Arsene Wenger made his big move on deadline day, when he managed to persuade a world-class talent to take his talents to the Emirates. Both sides acquired talented players in the no.10 role, and this weekend they showcased why the clubs aspiring to solidify Champions League football sought them out. David Moyes celebrated his first win at Old Trafford, as the Red Devils cruised past 10-man Crystal Palace. For what it’s worth, United struggled to find their rhythm until Kagisho Dikgacoi was wrongfully sent off for a foul on Ashley Young that actually took place outside of the 18-yard box. Ian Halloway’s men were organized well and they maintained a compact shape for majority of the half. Dwight Gayle, Mile Jedinak, Dikgacoi and Jose Campana tucking infield kept Michael Carrick and Anderson quiet, but it also left United space on the right to exploit. Fabio and Valencia worked hard to create overloads and isolate Dean Moxey, but the Palace fullback coped well. 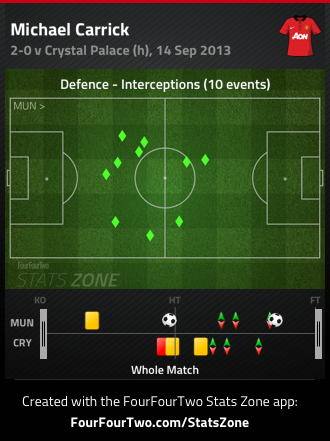 Moyes’ men dominated possession but they lacked thrust, penetration and creativity in the final third. A recurring theme in United’s style of play under Moyes is their intent on pressing the oppositions defenders on goal-kicks or when they attempt to play out of the back – which led to the Young controversy – and it’s been successful thus far. In fairness, United didn’t really face any scares on the defensive end, as Halloway’s men struggled to complete three successive passes, along with Carrick doing a fantastic job in breaking up play. United stamped their authority on the match in the second half with the man advantage, as Wayne Rooney began to drift around midfield picking up the ball and linking play, while substitute Adnan Januzaj was a direct threat from wide areas. However, United struggled to create legitimate goal-scoring opportunities, and relied on a Rooney free-kick to put the match out of sight. United has failed to score from open play since their opening day victory against Swansea, which shouldn’t be overlooked. The service from wide areas has been mediocre and Rooney still looks somewhat disinterested, thus leaving Van Persie craving service – because there doesn’t seem to be a link between midfield and attack. Nevertheless, United can’t complain about claiming seven points from four games – equaling title contenders Manchester City and Chelsea’s point tally – but they’ll need to improve in the final third if they intend on being victorious in next week’s Manchester Derby. Mesut Ozil displayed to Premier League fans why he was worth the £42.5m Arsenal splashed on him at the end of the transfer window. The German international enjoyed a fantastic debut for the Gunners, and was one of the few influential players in a third consecutive Arsenal victory. It took the German 11 minutes to make a statement, as he ran into space and calmly brought down a long ball, which he squared for Olivier Giroud, who gave Arsenal an early lead. 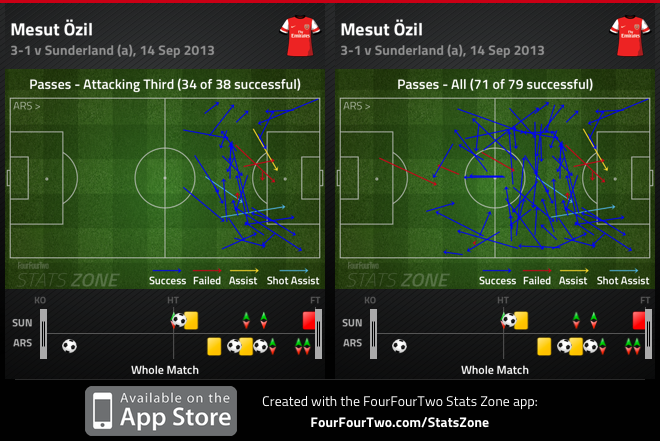 Ozil laterally glided across the final third, combining with wingers and dropping into midfield to overload central areas. Overloading central areas in midfield has been a feat in Arsenal’s approach over the past few matches – Ozil and Wilshere dropped into deeper to help Aaron Ramsey and Mathieu Flamini assert their dominance in midfield. 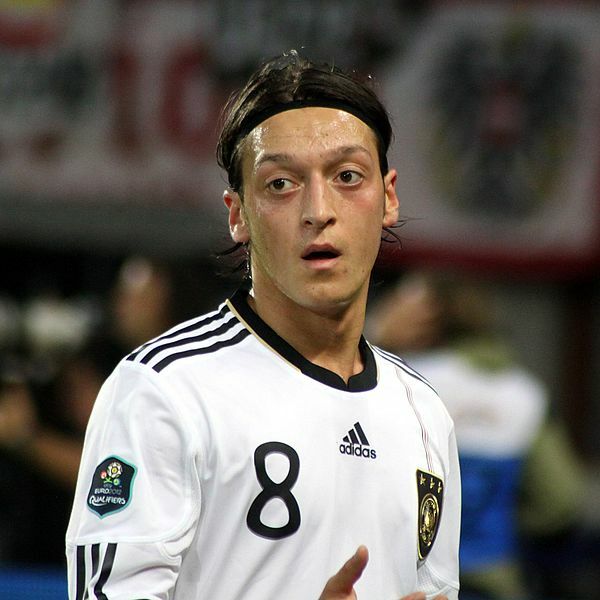 Ozil was most threatening on the counter attack, where he played two defence splitting passes, sending Theo Walcott 1v1 with Keiren Westwood, but the Sunderland keeper denied Walcott on both occasions. Ozil was imperious throughout the match, specifically in the first half, where he was allowed to attack pockets of space in the final third. Frankly, Paolo Di Canio’s approach to the match was lethargic. His side sat in two banks of four with his forwards failing to apply pressure to the centre backs and his midfield sitting off – with Adam Johnson tucking in – which allowed Flamini and Ramsey to dictate the tempo of the match and Kieran Gibbs to freely surge into advanced positions. Sunderland improved in the second half, and was awarded a penalty when Laurent Koscielny committed a clumsy challenge on Adam Johnson, which substitute Craig Gardner converted. Di Canio’s men limited the gaps of space in midfield, sitting narrow and compact, and Arsenal struggled to break them down. Meanwhile, Johnson began to penetrate in wide areas, and Sunderland was catching the Gunners out of shape on the counter. Wenger’s men were fortunate not to go down a goal, when referee Martin Atkinson wrongfully halted play when Jozy Altidore was clearly fouled by Bacary Sagna – but Altidore was on a clear breakaway and put the ball in the back of the net. Arsenal took advantage of their fortunes minutes later when Jenkinson got forward and played in a wonderful cross to Ramsey, who displayed great skill to volley the ball past Westwood. Ramsey put the match out of reach when he made a pass to Ozil and ran into space and collected a pass from Giroud, after he combined with Ozil. Ramsey was superb defensively, and he continues to show maturity going forward in midfield. This was one of the better Arsenal performances over the past few years, albeit it coming against a feeble Sunderland side. Spurs bounced back to winning ways with a convincing victory against Norwich City. Andre Villas-Boas handed Christian Eriksen his Tottenham debut, and the Danish midfielder flourished. A significant factor in Spurs’ loss to Arsenal two weeks ago was a link between midfield and attack, and Eriksen filled that void in a fantastic manner. Eriksen received balls between the lines and played key passes out wide and penetrating balls between defenders. The Danish midfielder provided a defence-splitting pass for Gylfi Sigurdsson’s opener and his ball out wide to an advancing Paulinho led to Sigurdsson’s second goal. Villas-Boas men cruised through the match due to Norwich’s lack of pressure and defensive structure. Soldado dropped into midfield and wide areas to link play, Dembele and Paulinho were allowed time to play sideways passes into wide areas and push forward, Sigurdsson drifted infield and made runs from midfield, while Andros Townsend’s direct running caused the Norwich backline several problems. Norwich rarely provided an attacking threat, but they did identify spaced behind Kyle Walker to exploit. Chris Hughton’s men attacked the right side several times, and they created their best chance of the match by doing so. Nathan Redmond broke free behind Walker and played a ball into the six-yard box for Ricky van Wolfswinkel, but Danny Rose recovered well and cleared the danger. The inclusion of Eriksen to the Spurs squad is a massive improvement – they now possess an attacking link that can create chances in the final third, which is an element AVB’s men required in their quest for Champions League football. Roberto Martinez earned his first win as Everton manager this weekend, as his men showed grit and resilience to fend off a strong Chelsea side. Samuel Eto’o and Gareth Barry made debuts for their clubs, while Juan Mata started in a no.10 role for the Blues. It was a tight opening half that saw Everton maintain a slight advantage in possession, but Chelsea got into better areas in the final third. John Obi Mikel tracked Leon Osman, Ramires kept tabs on Ross Barkley, and Mata pressed Barry when he dropped deep, while Eto’o occupied both centrebacks. Mourinho’s men aimed to hit the Toffees on the counter, but they failed to make the most of their chances. Mata slowed down the tempo when Chelsea broke on the counter, Eto’o lacked match sharpness and Andre Schurrle was poor in front of goal. 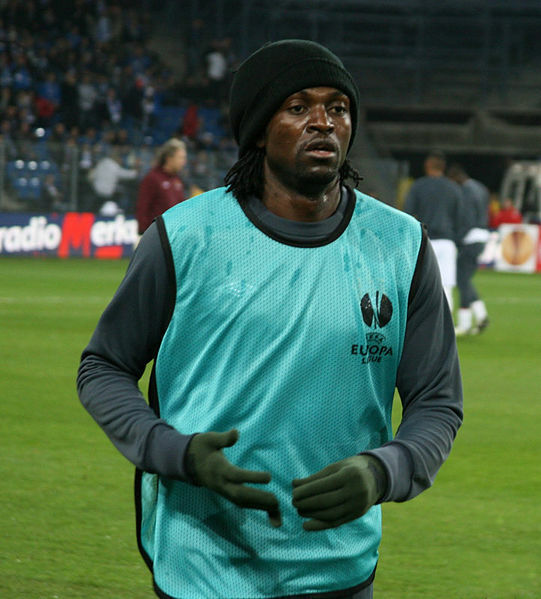 Ramires and Mikel were allowed space in midfield to play forward passes, while the attacking three drifted between the lines to receive the ball in pockets of space. Eto’o didn’t have a poor debut, and in the first half he displayed why he’s a better option than Fernando Torres and Demba Ba. Mourinho wants his centre forward to link play with the attacking three and interchange with them, thus providing fluidity in the final third. In the opening 45 minutes, Eto’o drifted to the right flank to allow overloads and connect with midfielders making forward runs. The Cameroonian striker should’ve handed the Blues the lead in the first half but Schurrle played a poor pass to the striker allowing Barry to block his shot. For all of Everton’s possession, they failed to create legitimate goal-scoring chances, often being stifled around the 18-yard box, but the Toffee’s found an area to attack. Surprisingly, Baines and Coleman were cautious about moving forward – and it was logical based on the space left available to expose on the counter – yet Coleman was more adventurous with his positioning. There was vacant space behind Cole to exploit on the right, encouraging Naismith and Coleman to overload the right flank. Despite Eden Hazard replicating the great defensive work of Naismith in tracking back, Barkley often drifted over to the right to maintain a numerical advantage. Everton took the lead at the stroke of half time when Ramires was dispossessed in midfield. The attack was pushed to the right and a cross was played into Nikica Jelavic, and the Croatian nodded the cross back to an open Naismith, who headed the ball in from two yards out. Terry was left marking space, while Cole failed to track Coleman’s run into the box, and after several attempts to exploit space on the right hand side, Martinez’s men succeeded. Chelsea rallied in the second half, upping the tempo and applying more pressure, but the Blues created minimal chances. Mourinho introduced Oscar and Frank Lampard for the unimpressive Schurrle and Mata, but they didn’t have a significant impact on the match. Martinez reverted to a 4-5-1, introducing James McCarthy for Jelavic, thus leaving Mirallas, Barkley and Naismith upfront – three players capable of causing havoc on the counter. Mourinho’s last attempt to salvage a result saw him introduce Torres for Cole, pushing Mikel to centre back and David Luiz to the left – but Torres was poor and Luiz didn’t offer much going forward. Osman and Naismith were standout performers on the defensive end – Naismith tracked back effortlessly to prevent Eden Hazard from isolating Coleman, while despite failing to dictate the match, Osman prevented Chelsea’s midfield from dominating midfield. Also, Barkley continues to display his significance to this Everton side, as he used his pace, trickery and vision to help Everton break on the counter, while playing a few key passes in the final third. Chelsea produced a good performance, which should’ve seen them up a goal or two in the first half, but the lack of quality in the final third led to their downfall – Everton took their chance and defended admirably in the second half, which merited three points. Southampton was one of many Premier League sides that made significant improvements in the summer, which has tipped many to believe that they could finish in the top half, this season. Yet, they’ve been ridiculed for their lack of creativity in their attack. Mauricio Pochettino continued to experiment with Rickie Lambert and Pablo Daniel Osvaldo upfront, but once again they failed to have test the West Ham back line. Sam Allardyce’s men pressed West Ham on goal kicks and when they aimed to play from the back, forcing Pochettino’s men to concede possession. Ravel Morrison, Kevin Nolan and Mark Noble closed down Victor Wanyama and Morgan Schneiderlin, who struggled to get forward to join the attack. Southampton created a handful of chances throughout the match, but Jussi Jaaskelainen made several top saves to keep the score leveled. Adam Lallana and Jay Rodriguez drifted centrally, while Lambert moved into wide areas to receive the ball, but the quality in the final third was dire. Pochettino’s men improved in the second half with Schneiderlin occasionally making darting runs into the box, Rodriguez running at defenders from central positions and West Ham’s press dwindling. West Ham struggled to create opportunities going forward, receiving their best chances from wide areas, specifically Jarvis’ delivery. Allardyce looked for another element of attack by introducing Ricardo Vaz Te, but the Portuguese forward was merely an isolated figure. The Hammers had a chance to take the lead in the dying minutes of the match, but James Collins skied his shot from six yards out. More importantly, Southampton lack a link between midfield and attack, and the Lambert/Osvaldo experiment is failing miserably, without a creative spark. It was surprising to see James Ward-Prowse enter the match so late, and Pochettino’s reluctance on using Gaston Ramirez. Nevertheless, Southampton drop more points in another match that they dominated, and it’ll be interesting to see how much longer Pochettino sticks with the Lambert/Osvaldo duo and keeps Ramirez on the bench. Robin van Persie scores his 125th Premier League goal and the first vs. Crystal Palace. Of the current Premier League clubs, he has now only not yet scored vs. Cardiff City. Since the start of 2008/2009, five players have been sent off for fouls on Ashley Young, joint most of all current Premier League players with Scott Parker. Christian Benteke has now scored 9 goals in his last 10 Premier League home matches for Aston Villa. Everton & Liverpool keep clean sheets in their opening two top-flight home matches of the same season for the first time in history.